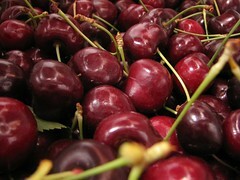 Angelo's been anticipating this post -- every summer I go off about cherries at least once. He finds my fruit obsession to be a source of amusement, and rightfully so. Anyway, the cherries are outrageous. We've been nibbling at smaller quantities, but this week Tannis bought 22 pounds from our neighbour ($1.60/pound) and I've been gorging myself -- Pearl and Tannis canned a bunch and I hope we'll freeze a few bags worth. We also dried apricots and the peaches seem early this year. The Saturday Farmer's Market in Penticton was fantastic this week with so much good stuff in season right now -- we also had fun drumming there and picked up the new Harry Potter book while we were downtown. On the way back just before noon, Sunoka looked so nice that we stopped to swim in the waves despite having limited beach gear along. Saturday night, Bill and Sam joined us for some hanging out and supper. Mellow and fun. I know you've been waiting with baited breath for my Annual Fruit Post. Enjoy! Heather, Larry and Pearl are staying well into August, so it will have to be canned ones that go back with them. I'll try to remember.